In this survey we consider the development and the mathematical analysis of numerical methods for kinetic partial differential equations. Kinetic equations represent a way of describing the time evolution of a system consisting of a large number of particles. 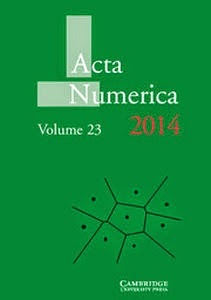 Due to the high number of dimensions and their intrinsic physical properties, the construction of numerical methods represents a challenge and requires a careful balance between accuracy and computational complexity. Here we review the basic numerical techniques for dealing with such equations, including the case of semi-Lagrangian methods, discrete velocity models and spectral methods. In addition we give an overview of the current state of the art of numerical methods for kinetic equations. This covers the derivation of fast algorithms, the notion of asymptotic preserving methods and the construction of hybrid schemes.